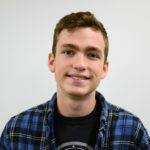 In 2009, Pennicott moved to New York City to pursue a career as a full time musician, doing street performances and living out of his car until he worked his way up to higher paying gigs. In addition to collaborating with notable jazz artists and groups, Pennicott has formed his own jazz combo, and released his own album “Lover of Nature” in 2014. I got the opportunity to sit down with Pennicott this past Wednesday, and spoke with him about his experience in the music industry and his life before and after deciding to pursue a career in music. 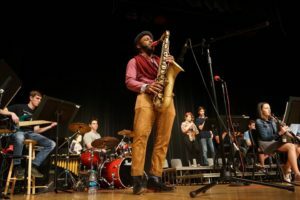 This was possible due to the tireless efforts of IHS band director- Jason Olear who coordinates the Jazz Artist in Residency Program for the Indiana Area School District’s Jazz bands. Every year, Olear coordinates a massive concert featuring jazz bands from elementary to high school levels. During this program, we get to practice, and learn from experienced musicians who work and make a living in the music industry. Below, are some highlights from when I sat down with him, as well as from a question and answer seminar that he held with the high school jazz bands. Why did you decide to get into music full time? I knew I was always gonna do music. I was actually a big baseball player in high school. I was being recruited to colleges to play, but around the same time, I qualified for a high level high school jazz competition, the Sensually Ellington Competition, in NYC. However, it happened at the same time as states for baseball. I was trying to decide between that and the baseball game and I went with the jazz. I’ve known that music is what I want to do since then. My approach is I really value my experience. I was fortunate to be successful young. It’s kind of a way of a relaxed but focused way of being. Showing people you have to enjoy the journey rather than enjoying the accomplishment. Enjoy the journey, having fun and bringing the music to the community. Out of all of the places you have performed, which one was your favorite? If you could tell yourself one thing, back when you were a student, what would it be? I got into jazz because of Joshua Redman. I heard one of his tracks off of “hide and seek” and he was doing crazy stuff on the saxophone that I thought were really impressive. Joshua redman was the guy that I heard first. He’s kind of modern. After hearing about him and what he’s doing, my band director told me about Duke Ellington. It was down the rabbit hole from there. What do you enjoy outside of playing music? Outside of music, I like basketball. I’m the shortest man on the court. I still get good assists. I love playing it and love watching it. All the NBA. I like to go see comedy stuff in the city too. I’m also kind of curious about philosophy and all that. As a musician how do you measure your own success? There’s no limits. You go until you feel like you can’t go farther. I don’t feel like I’ve necessarily made it in a sense of a Hollywood thing. I don’t know If I would want to be so popular so that like everyone would know who I am. I’ll go there if I can, but it’s not necessarily my goal. I just want to enjoy myself and give back to the community. How did your family feel/react to you trying to make it as a musician? How hard was networking to jumpstart your career? There are thousands and thousands of tenor saxophonists in the world, so a lot about aht is on tour, if I play amazing and wow everybody, they want to know who you are. They want to know if they can hang out with you and not be annoying. You have to be a person who is really fun to play with. Like maybe there is one person who is a really good player, but they don’t smell good. You don’t want someone who is always complaining and has a lot of energy. Sometimes there are shy people who are really good but they don’t play much and don’t have a lot of energy. What is your advice to an aspiring music student? There’s two things, firstly, make now count. In this time you have now, you have the most time on your hands than you will ever have. It’s easier said than done, but if there is a way and you know what you want to do with the rest of your life, get as good at it as you can now. I don’t know if I had big leaps as an adult as I had in school. It’s such a big and important time. Be a nerd if you have to. The second thing is to learn the business of what you do. It’s really important for just music in general. There’s music, harmony, theory, and melody. Also know who you are. Find your brand and your own voice. What’s your thing. For example, the mouthpiece I use had nothing to do with the sound. It’s just like a way to differentiate yourself from others. It’s a branding thing that helps me. I make sure I take care of the music first, have a good tone and know your stuff. But outside have your style and passion. Have your social life, and stay up to date on what’s happening in the world. Know how to make an album and set it up. Also know life stuff, like finances, and make the right call. If you’re going into the arts you have to find your own way, unlike day jobs where there is a structure in place. Tivon Pennicott, is an incredibly kind and charismatic person. During my time with him, he would joke around and crack himself up. He had a way of talking very quietly that would bring you in and focus on what he said. He seemed to really enjoy the experience of being here and interacting with us. Just before the interview, he was joking around with some of the students, riffing complicated whistling bird calls back and forth. He is an incredibly humble, and relaxed person, and it was an honor to get to work and make some noise with him this past week. 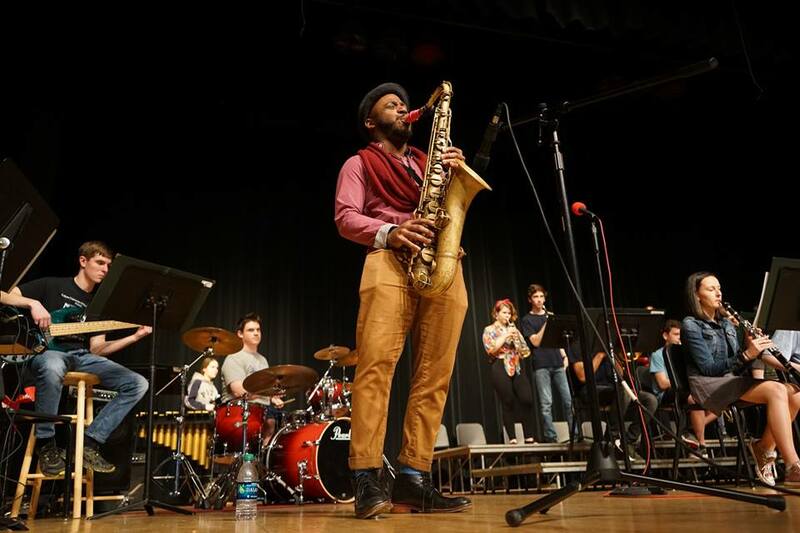 Photo caption: Tivon Pennicott plays his saxophone in the Jazz Bands of Indiana Concert.